It's the holidays, and you know what that means. Sugar, processed foods, cookies, fudge, mashed potatoes, pie…. everywhere you look. Like to lose weight, balance your blood sugar, or reduce inflammation. These goals are so important. You've invested a lot of time and effort — and even money into starting and staying on track. You would hate to lose ground! It's so hard to resist those sweets and treats. Is it possible to stick to your healthy eating plan and still enjoy your food? Be encouraged! Not only is it possible to enjoy Trim Healthy holidays, it might be more doable than you think! In today's #AskWardee, I'm giving you my top 5 tips for staying on Trim Healthy Mama through the holidays… despite mashed potatoes and pie! Go here to get 3 more tips… for a total of 8! Q: How To Stay “On Plan” During The Holidays? Wardee, I've been doing sooo well on Trim Healthy Mama and feeling great. Yet, I just know that the Christmas cookies and pies and mashed potatoes are going to be my downfall. Do you have any tips to help me stay on course and not give in? Thank you! Really, though, the last thing most people want to hear about during the holidays is healthy eating or weight loss. This tip isn't just to keep the peace during Thanksgiving or Christmas dinner, however. It's also for YOU. Because you don't have to explain or justify your efforts to take care of yourself and reach your goals — even if it is a special occasion. If anyone asks why you're not eating the pecan pie or the mashed potatoes and gravy, don't feel you have to jump into a full explanation of Trim Healthy Mama. Simply tell them those foods don't agree with you anymore (because they don't!) or that you're trying new foods (because you are!). If you're planning to spend your holidays away from your own home, call your host ahead of time and ask what's on the menu. This lets you know if the meal is leaning more toward S (Satisfying) or E (Energizing). And then, you can plan to bring at least one THM side dish to complement the meal. I don't know about you, but we never show up to eat at someone's house without contributing something — even if the host didn't specifically ask us. Chances are good that there will be some sort of meat, like turkey or roast, and vegetables. So, plan another side dish to bring and share, and you're all set to stay on plan! It's easy to stay on plan when it comes to meats and vegetables… Yet dessert is a whole other feat! I've never been to any holiday gathering where there weren't just as many (or more!) dessert options as savory options. Pies, cookies, cakes, punch, hot cider, hot chocolate, Cool Whip … sugar is EVERYWHERE. Any of the desserts from Sweet Without Sugar — like Double Layer Pumpkin Pie, Thin Mint Tart, or Coconut Cream Pie! (all THM:S desserts with nourishing foods!… keep scrolling down!) — currently 40% off and if you forward me your receipt, I'll throw in a sugar-free ice cream recipe of my own! And when all else fails, have a handful of these no-sugar, stevia-sweetened chocolate chips that contain no fillers and are oh-so-yummy! This requires a bit more work, but it also gives you total control! You can create a totally THM holiday menu because you're in charge! You provide the basis of the meal — healthy meat, cooked veggies, salad, homemade dressing, one or two desserts — and if your guests offer to bring a dish, they can bring whatever they want! They're happy, you're happy (and on plan), and everyone has a happy holiday! Given the choice, many of us would skip the turkey, cranberry sauce, and stuffing — and gorge ourselves on the mashed potatoes instead. Don't worry, you're not alone! Yet, as yummy as they are, mashed potatoes won't help you stick to your Trim Healthy Mama plan or goals. If you just can't imagine a holiday without them, have a small serving and don't feel guilty at all. However, if you're determined to stay on plan, may I suggest No-Fail Cauli-tatoes instead? These are super creamy, and you can add as much butter as you want. 😉 Yet, they're much lower in carbs, so they fit right in with your S (Satisfying) holiday meal! What's This About Trim Healthy Mama? 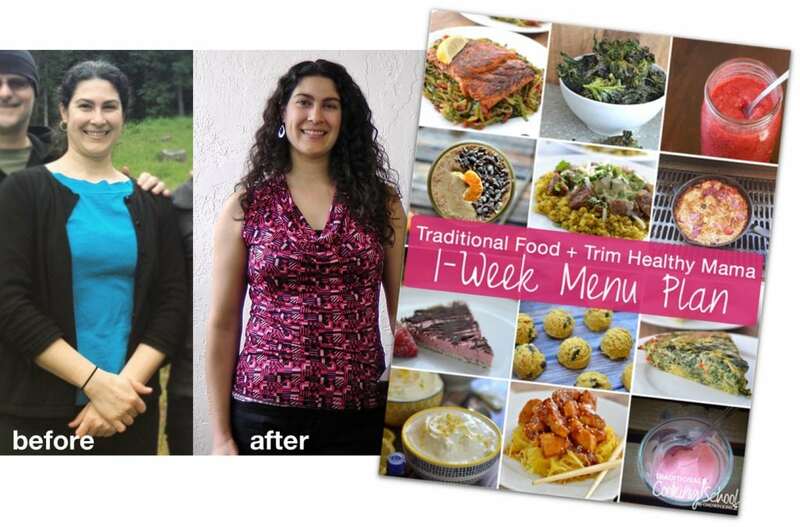 I followed Trim Healthy Mama, combined with Traditional Foods to lose more than 30 pounds in a year (and I'm keeping it off to this day). If you'd like a free 1-week menu plan that I put together that's a lot like the foods I ate (and still eat), click here to sign up. 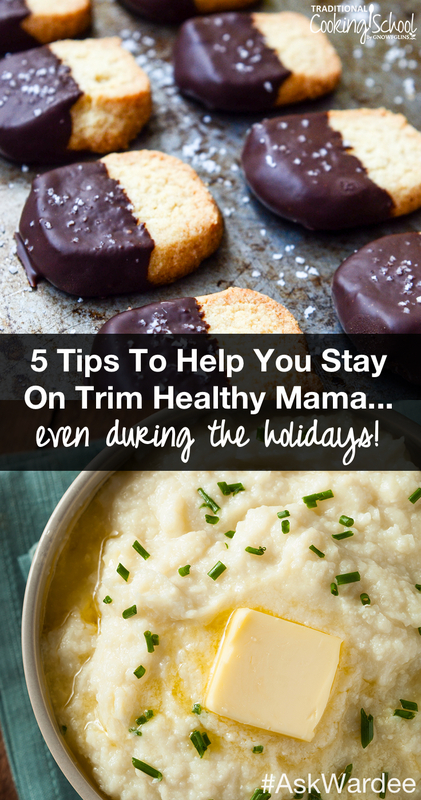 3 more tips for staying on Trim Healthy Mama during the holidays! Sweet Without Sugar eCookbook — chock-full of sugar-free ‘S' desserts! — currently 40% off! plus get a free sugar-free ice cream recipe from me if you forward your receipt to me. What are you doing to stay on Trim Healthy Mama during the holidays? Please share!